We attended Maison & Objet in September 2017, one of the largest interior design trade shows of the world. Comfort was the theme of this edition of Maison et Objet. Yves Badetz, the Director of the National Ernest Hebert Museum and the General Curator of Musee D’Orsay and Eric Gizard, Interior Designer for Air France, spoke to us about this theme. Their conversation tackled the different views of a historian and interior designer on the notion of comfort. The following text is inspired by this conversation. Lighting is something many people take for granted, especially in Vancouver. Many of us live in a high rise building with windows from ceiling to the floor. The natural light flows in. Natural light puts our body at ease and tells our brains when its time to wake up and go to sleep. For those of us that have been travelling by plane often, will have noticed the lighting. The lighting in the aircraft changes to influence your behaviour. It calms you down, puts you to sleep or wakes you up for landing. The lighting often helps the passengers get in the same sleeping pattern of their destination, to ease out jetlags. There is a reason why light effects us so much and that is because our brain can learn a lot from what is going by lighting. Take advantage of this fact and use this light to support your lifestyle. Brighter lighting in public/active places will make you more productive. Soft lighting in your private and calm places will help to put you at ease. Even Apple has adapted the importance of light by creating a night mode in their software, making sure your brain is not unnecessarily being kept awake by bright light. Direct lighting, like spots and office lamps create intens lighting. Indirect lighting like most standing lamps or night lights are more calming. Public/Private, Active/Calm is division you should also consider when organizing your home. Different rooms in your house have different purposes and you can define them with these adjectives. A living room where you would entertain guest is public and calm, a dining room is public but active, a bedroom is private and calm, an office is private and active, … and so on. In a private space you can promote tranquility with colours, lighting and feel. Softer fabrics together with softer colours and a dim light will help you get into the right state. While cleaner and smoother objects/looks with more direct lighting will create a more active state of mind. The obvious but not to be overlooked way to create comfort by sight is to assess if something looks appealing. The image of having space in your home can be achieved by not overcrowding and not dividing a room by high objects or wide horizontal objects. Last but not least, hide clutter. No reason for cables from tv or computer to be sticking out or the sight of a box underneath the couch. You will take notice of these little things and keep them in the back of your head. Once again I can say that true comfort is attained by the things you don’t notice or don’t think about immediately. One of these things is sound. An example of this is BMW, they have isolated their cars so well to minimize road noise … that the driver was no longer able to hear the sound of their own engine. As a car enthousiast this is disappointing. So instead of compromising on their sound isolation they recreated the sound of the engine inside the car. The sound of the engine you are hearing therefor is not live, but you get the best experience. Trying to cancel out street noise or such in your home is out of your reach. But going back to the paragraph of a comfortable touch, you have to split up your home. At Maison et Objet we saw the A speaker from Akoustic Arts. This A speaker, realized by new technology, will only create sound waves in a specific direction and isolate these sound waves to travel anywhere else. This makes it possible to hear the music while you stand underneath the speaker beam but not hear any of it if you take a step to the side. Quite an unusual-looking speaker with its honeycomb of mini transducers (200 in total). We wanted to revolutionize the traditional listening experience, so we created a technology to redefine personal audio. The A is a directional speaker that creates a highly targeted beam of sound, the same way a laser creates a beam of light. You hear sound only when you’re inside the beam. Outside of the beam, there is no sound whatsoever. The A makes it possible to have multiple speakers playing different audio content in the same place. You can listen to what you want without disturbing people around you. It’s like listening to headphones without headphones. 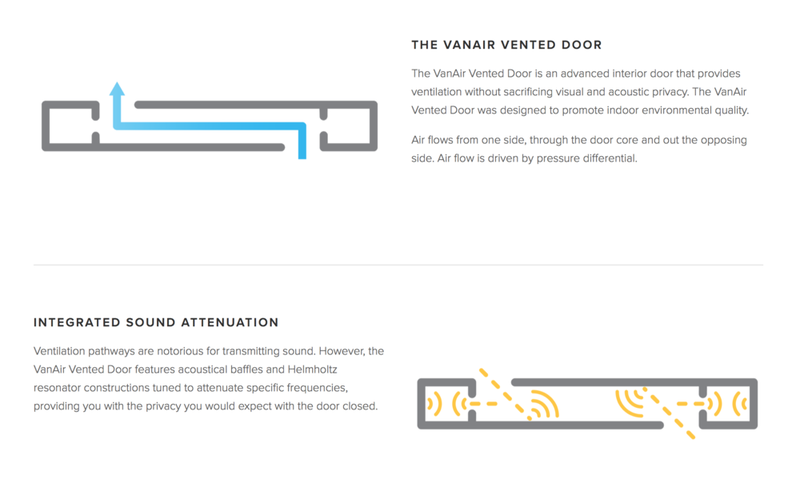 VanAir Design, a local company, has created a vented door that has an integrated system that minimizes sound. VanAir Vented Door featured an air vent that travels throughout the whole length and width of the door. The air vent is designed in a way that acoustical sound waves become trapped. Therefor this door can provide you with the privacy of a closed door. These doors can be used anywhere around your house or in the office. Especially now that fall is here, we will focus on smell because who doesn’t associate pumpkin scented candles with fall. Everybody has the different scented candles or even different perfumes for the different times of the year. You can take this to a next level and create different scents for the times during the day. Piet Boon created 4 different scented candles for serax. 7am, 10am, 6pm and 11pm. The intensity and character of the scent are so distinct that you are able to break up your day in scents. These scents will get you in the state of mind of your desire or recreate homely feelings. With this notion you can again go back to the private/public space and active/calm space in your home. Food is tasted not only with your mouth but also with your eyes. All chefs pay attention to the way their food is presented and the tableware is a part of that. Sergio Herman and Pascale Naessens are two designers whose tableware we carry that are also chefs or culinary authors. They decided to create their own tableware to fully emerge their food in their views and create a full experience for the person who is eating it. This is one of the tricky things about designing tableware, it should look great with food on it and it should make the food look great. A simple white set of tableware is a safe bet when buying tableware because it will look good with any food. More earthy colours have been becoming a trend in tableware design and in my opinion that can be linked to the increase in natural and organic foods that are prepared in our homes. Overall the information in this article are not guidelines for how to achieve comfort in your home but information that will make you question your choices of furniture and home decor. When you are cautious and truly assess everything you are buying you will be able to put together the perfect home for you. To quote the Netflix hit show; you want to fill your home with things that spark joy. Comfort is a feeling and is not an objective. Comfort is not a couch you never want to get off of, but a couch that supports your lifestyle. Why would you have a couch that is soft and thick and sleep-inducing when you often entertain guest until the late hours? To have a comfortable home means a home that is suits your needs. Do you work from home…? Do you often have guests over…? Do your guests like dinner parties or late night soirees…? Where do you spend your downtime…? What is your favourite season…? Do you spend the weekend on the couch or fly from event to event only stopping home for a change of clothes…? How can your home accommodate these needs...? While overwhelming at first, addressing the needs of your day to day life is the first step in ensuring you are comfortable in your home. We start by assessing a comfort through touch. It is said when something is comfortable it will dissapear. You only notice how comfortable something is when its gone, like doorhandles you only notice in the home of another. Your flooring is one of the most important things you will choose for your home. Tile, hardwoord, vinyl, carpet and cement give different looks feelings. Cement and tiled floors can be made softer in more intimate spaces by area rugs. Though cement and tiled floors don't immediately convey comfort, you are able to clean them with just a wipe. That makes your cleaning much more comfortable doesn't it? Hardwood and vinyl are very close together in looks and in comfort. Hardwood has a different feel with bare feet for the real connaisseur, but is also more fragile if you drop items and spill liquids. Carpets can be comfortable, but wear and stain. A large decorative area rug can compensate for this. Address your lifestyle through your decor, noting how your home feels against your toes or finger. Next week we will discuss how we can achieve comfort through sound, sight, smell and taste. AP collection is a love story!